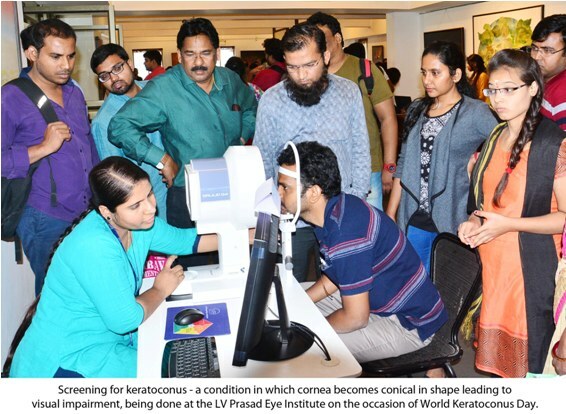 Hyderabad, November 10th, 2018: To increase awareness regarding the Keratoconus disease amongst the public, the TejKohli Cornea Institute (TKCI) at L V Prasad Eye Institute (LVPEI) organized a Patients’ Interaction Forum today at the Institute coinciding with World Keratoconus Day. The purpose was to provide a platform to the patients and their parents to interact amongst themselves and the doctors to collectively share problems and concerns arising out of Keratoconus and discuss the possible solutions. Keratoconus is a clinical term used to describe a condition in which the cornea assumes a conical shape due to thinning and protrusion. The disease process results in mild to marked impairment of visual function. The cause could be genetic or inflammation secondary to eye rubbing seen frequently in children who have allergic eye disease. “The onset of Keratoconus generally occurs at about the age of puberty, however we see keratoconus at age as low as 7-8 years too,” said Dr Mukesh Taneja, Consultant, Cornea & Anterior Segment, TejKohli Cornea Institute, L V Prasad Eye Institute. The cornea begins to thin and protrude resulting in irregular astigmatism. Typically, the process continues over a period of 10 to 20 years and then the progression gradually stops. Dr Taneja further added that the severity of the disorder, at the time when progression stops, can range from very mild irregular astigmatism to severe thinning, protrusion, and scarring which may require corneal transplant. Treatment options available for Keratoconus include spectacle corrections, rigid contact lenses, and intracorneal ring segments to improve the vision and rehabilitation. In recent years, the goal of Keratoconus treatment also includes prevention of further disease progression, besides the improvement in visual acuity of the patients. If detected early, it is possible to stop the progression of the disease at an early stage itself by a simple procedure called Collagen Cross Linking (CXL). “Over the past 30 years, we have seen approximately 12,000 patients of Keratoconusat LVPEI, ranging from mild to severe variety. At LVPEI, have all treatment options available for Keratoconus including Collagen Cross Linking for preventing it from progression, speciality contact lenses for visual improvement and also surgical options like Intracorneal Ring Segments and Corneal Transplant in patients with severe Keratoconus,” added Dr MukeshTaneja. बाज़ार का प्लास्टिक बोतलबंद पानी पीते हैं तो हो जायें Alert! March 18, 2018 healthfortnight Comments Off on बाज़ार का प्लास्टिक बोतलबंद पानी पीते हैं तो हो जायें Alert!